The metal copper is made up of Cu (metal atoms) and is a very common metal that is used by humans in different ways. In its natural form copper is pinkish or peachy colored. Like other metals for instance iron copper also undergoes the process of oxidation. Oxidation is basically a process in which chemical changes take place when a substance is exposed to the elements present in air. In case of iron this process is generally known as rusting. Iron is found to rust into an orange-brown color where as copper oxidizes into green color. Another example of oxidation is a freshly cut apple that always turns from white flesh to the dark brown when it is exposed to air. 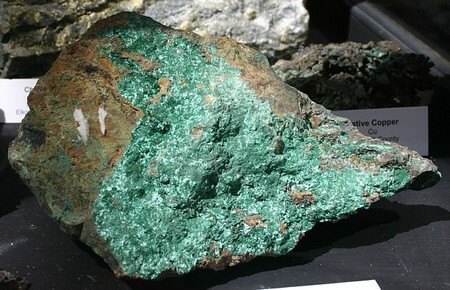 Due to the reaction with oxygen copper turns green when it is exposed to the atmosphere. in the air water or rain is dissolved in the oxygen due to which a reaction takes place when copper sits in the air for a long period of time. Copper is used for electrical wiring reason being, it is a good electrical conductor, provides a good contact surface, copper is ductile which means that it is easily bent repeatedly without breaking and it is not too expensive. It is vastly used in electrical equipment, appliances and gadgets. One other useful property of copper is that it can easily fuse with other elements. When copper is fused with zinc brass is produced which can be used for making ornaments and decorations such as candles sticks, necklaces, imitation jewelry etc, use of brass is almost endless. One can easily determine which element is dominant by looking at the color of brass. If it is pale then it has a lot of zinc in it. Copper is vastly used in plumbing as it has the property of being resistant to corrosion and is a good heat conductor. Using copper to manufacture pipes makes flow of hot and cold water quite easy. Copper being a good conductor of heat is excessively used in the making of kitchen utensils. The combination of copper with tin gives the utensils their non stick feature. According to an estimate every home has at least half a ton of copper. It can be seen everywhere in wiring, appliances, pipes, electronic equipment etc. Cars have electronic and other equipment in which copper is used so each car may carry almost 50 pounds of copper. Due to its versatility copper has earned the position to be called eternal metal. Apart from being a good conductor of heat it is soft, durable and can be bent into any shape thus has become an important part of engineering and construction. It is now being used in space flights as well. Copper is an irreplaceable metal and we cannot deny its usefulness as it is all around us. Copper has become kind of a necessity as it in used in our computers, wires, pipes, fridge, microwave, washing and drying machines, vehicles etc.